Finally U-Boot is running on the new board – it took two full days (and partially -nights) to make that happen. Initially I had no idea what exactly happened when control was passed to u-boot (I already knew that memory is OK and the u-boot image ion the board’s memory is the same as generated on the host and serial port software was under suspicion, so I looked for an independent (of the UART) way how the software could tell me that it reached some points. Obvious solution – general purpose I/Os, but unfortunately most of them are either routed on the inner layers or have multiple functions (shared I/O pins) – and I did not know if any of the software (ROM boot, first stage UBL or U-Boot itself) control them. Just one GPIO pin was not shared and had easy access – connected to the 64-pin QFN package with 0.5mm pitch pins – pins are on the sides, not under the belly as on the BGA ones, so I just soldered a wire to that pin and was able to watch it with oscilloscope. With that one-bit “printf” life got easier – I was able to find that the serial port output was the one having problems. In most cases it just silently got stuck, but sometimes the serial port was sending out 5-bit zero data (seems like control register that was programmed to 8n1 initially, got zero written to it and switched to 5n1. I still do not understand what did I do wrong and why supposedly working software failed in my case. I resolved the problem by replacing the 8-bit UART registers (separated by 3 dummy bytes) with the 32-bit ones – same as was done in the first initial bootloader that I already had working. 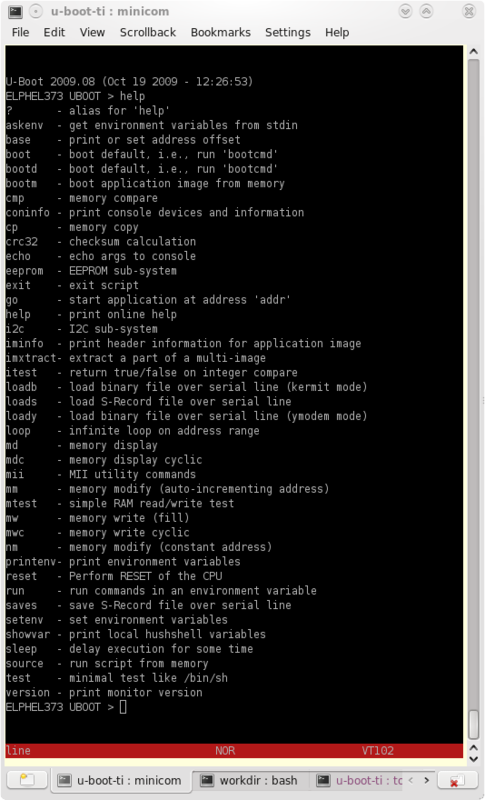 With that small mystery unresolved the u-boot is now running as you can see on the screenshot. A running uboot is nice. 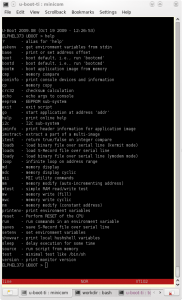 All processor setups should in the uboot and the system setting in the kernel. All what normaly is done by the BIOS on a PC specially timing settings for FLASH and DRAM. If you have some trouble, ask me. I have done this work for an ARM9.